Keeping a small space tidy when you have lots of stuff doesn’t have to be an epic challenge. With these easy additions and clever storage ideas, you can control clutter and make daily cleanups a whole lot easier for everyone. Make it super-easy for kids to keep toys organized with inexpensive mesh laundry bags. Hung at kid-height for easy access, they’re perfect for small items like building blocks and games with multiple pieces. Plus, kids can see inside the bag without opening it! 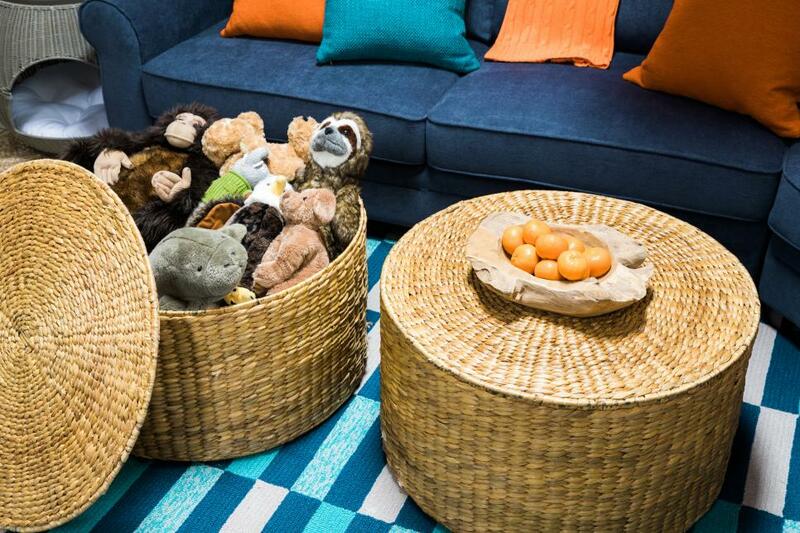 Multifunctional storage can keep your family room from looking like a playroom. And for families with lots of kids, that’s magical! Group several ottomans around a table to save space. If you have small kids, opt for ottomans with soft-close hinges so little fingers don’t get pinched. Don’t overlook the potential storage a coffee table offers. 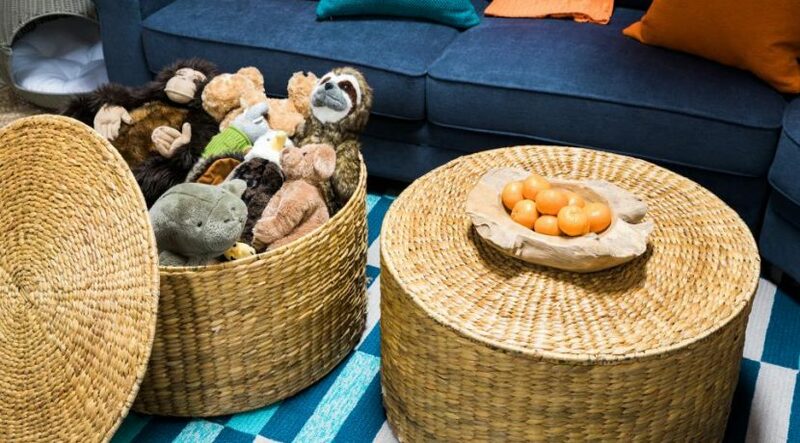 Lidded baskets and bins look great in pairs and are just the right size to store oversized items like blankets and bedding. Repurpose an old kitchen cart into a kids’ activity outpost. They can play around it, then store their crafting supplies inside when they’re done. If there’s more drama in your house about toys than there is on your favorite reality show, it may be time for a toy sorter. Repurpose a laundry hamper with dividers into a two-kid rolling storage unit. Simply wheel it out of the room when guests come over. In a tight space, you need to exhaust all storage possibilities. If you’re looking to store kid stuff, get down on their level, then scout the space for opportunities. For example, low shelves under a dining table or console can provide an ideal spot for board games, books or that dump truck you keep stumbling over. Encourage little ones to clean up after themselves by labeling bins and cubbies with photos attached so they’ll know what goes where. Simply cut the images straight from the toy’s packaging to save time (and recycle a bit, too!). Store pet food and treats within easy reach with a pet feeder. Older dogs appreciate the elevated bowls that minimize neck strain. And they’re easy for kids to use, so you can add “feed the dog” to that chore list. Keeping their height in mind, store children’s shoes and play clothes in baskets and bins low to the ground so they’re more apt to clean up after themselves.